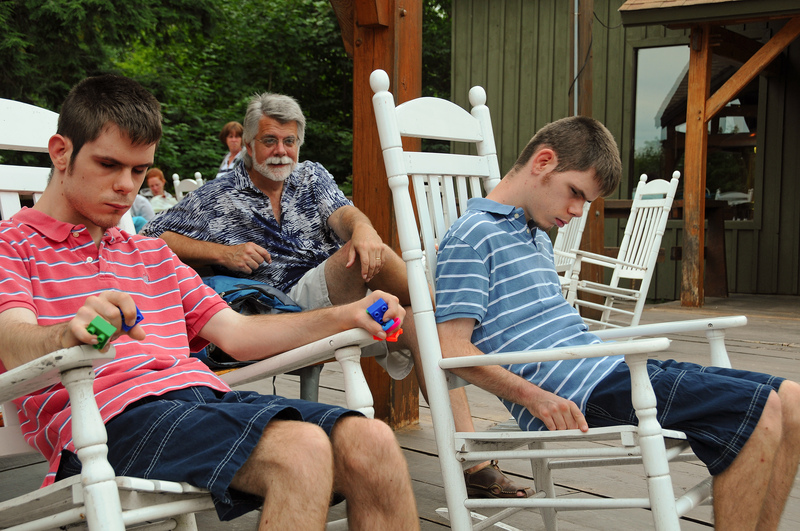 Several of you have commented or inquired about Ross and Ryan’s limitations on walking. Their limitations walking are mostly us! Well, not exactly. They have the energy of youth, but their gait is poor & inefficient, so they tire quickly. Mostly, though, they learn so much by the tactile responses from the surfaces where they walk that they linger and explore with their feet….which means a walk of 100 feet across a parking lot, curb, grassy strip, sidewalk, and lawn…can take an eternity! They’re quite capable climbing stairs, but take soooo long. Rocky paths are slower! We walk with them for exercise, but usually try to follow a consistent surface, even if that means walking around the same parking lot several times. And then there’s the matter of their short attention span: 5 to 10 min. They are willing to sit quietly for longer than that if the sounds around them are low, consistent, and pleasant. We’ll have to start including photos of them simply waiting….sometimes sitting on a large rock along the shore, but usually a bench near a sidewalk. Here’s one from this week when we popped into a store for a minute: this would be a highlight for them, because rocking is their favorite action…they will rock for hours! Notice Ross has his hands FILLED with blocks…always. Notice Ryan slouched…he’s exploring the chair, and maybe his feet have been extended to explore the decking. In the beach photo, notice Ryan is holding onto Robyn with both hands. Probably because of the sandy footing, but he sometimes walks a parking lot the same way. Very inefficient style of walk, but he really likes connections. In the same photo, Ross has a stiff leg extended. This sort of illustrates his poor gait. This beach walk was the one that ended up with them sitting in piles of rocks (see post for Aug 26). 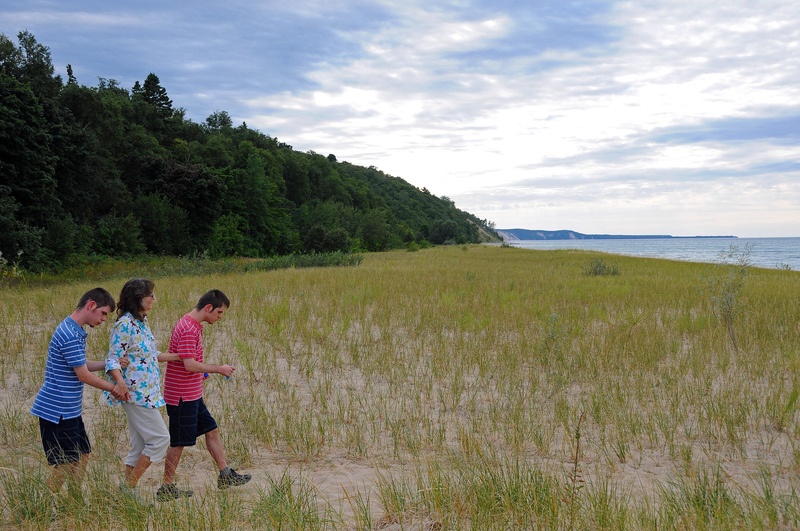 This was a major event: down a flight of steps, across the sandy dunes, then along the rocky shore. After gathering rocks, and walking all the way back, we ALL were exhausted, and slept like rocks! So Glad you are there for them! I had no idea that they could walk so well. Had only seen them sitting. Robyn and Doug you’ve done a good job! !